Many people are surprised to learn that there is more than one type of migraine. Typically, the throbbing, insistent pain that’s characteristic of most migraine events is what comes to mind. However, a relatively small portion of migraine sufferers – about one out of every 200 – will experience visual symptoms without headache. This is known commonly known as an ocular migraine. An ocular migraine causes vision loss or visual disturbance that lasts less than an hour and typically affects only one eye. 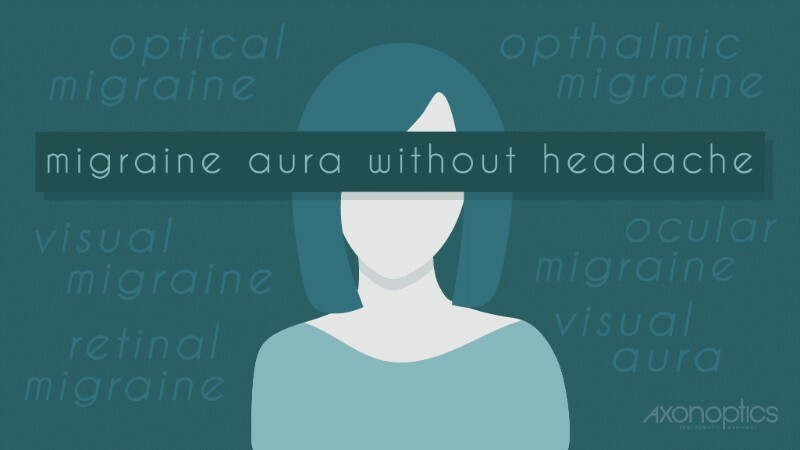 It has also been called optical migraine, visual migraine, retinal migraine, ophthalmic migraine, or visual aura; however, the correct name and classification according to the International Headache Society is migraine aura without headache. At Axon Optics we receive numerous emails and social media queries about ocular migraines. This has raised our awareness that our precision tinted lenses are of interest to a wide reader base and we are committed to providing the most current research findings on a broad spectrum of migraine related disorders, including ocular migraines. This guide is designed to help those suffering from this relatively uncommon condition. 1.3 What Causes Visual Aura? 1.4 Who is at Risk? 1.5 Why Do Some People Have Ocular Migraines With No Headache? 1.7 Do You Have Migraine Aura Without Headache? Migraine with aura refers to visual symptoms that occur before a headache and other migraine symptoms develop, sometimes up to several hours before onset of a migraine. 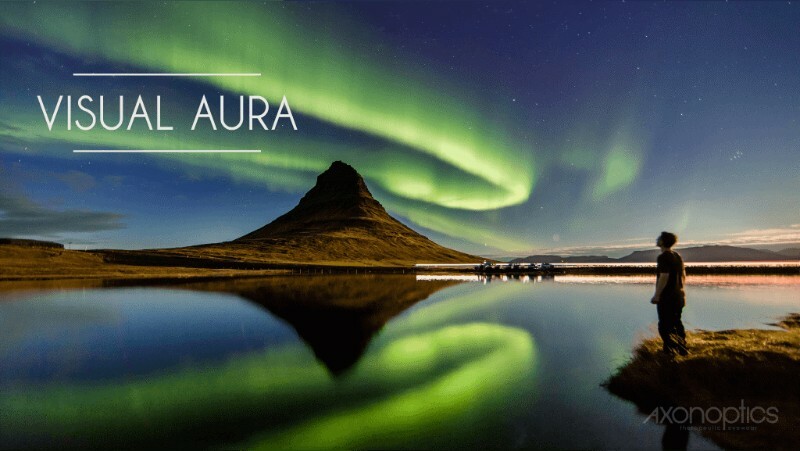 Aura occurs in about 20 percent of all migraine sufferers, and most of those people go on to develop the throbbing, deep headache that is often associated with the migraine experience. and even complete temporary blindness. Some patients may also experience additional symptoms of migraine, including nausea, fatigue, confusion and irritability, while others may experience only the visual symptoms. Retinal migraine is sometimes referred to as an ocular migraine, but they are not the same. While the two conditions do share some symptoms, the nature of the attack itself and how the vision is affected are the most telling ways to distinguish between the two. Retinal migraine – Vision disturbance occurs in both eyes which may lead to temporary blindness. Ocular migraine – Vision disturbance occurs in just one eye and may include zig zag lines, blind spots, flashing lights, visual blurring, “seeing stars,” or visual dimming. There has long been controversy in the medical community about retinal migraine. Some researchers even question it as a valid condition or accurate diagnosis. Ocular migraine, on the other hand, has been widely accepted as a type of migraine. There is evidence, though, that there are two distinct conditions, each with its own symptoms.As you can imagine, when an ocular or ophthalmic migraine occurs, the visual symptoms can be quite worrisome for those who don’t realize the symptoms’ association with migraine. And because ocular migraines don’t receive nearly as much attention in the literature as migraines with painful headaches, many people who experience a visual migraine mistakenly attribute their symptoms to a problem with their vision or even with serious medical events like stroke. Not that long ago, researchers believed migraines were related to problems with blood flow in the brain. But more recent advances have led to a much more comprehensive understanding of migraines and the underlying processes that cause them to occur. Now, medical researchers and doctors believe migraines are caused by an interaction between the nerves and the blood vessels in the brain, classifying them as neurovascular events that occur when nerve activity causes changes in the circulation in the brain. Whether they cause headache or not, migraines are usually triggered, or precipitated, by specific stimuli, including illness, stress, food sensitivities or allergies, sleep problems, exposure to bright lights or loud noises, or consuming caffeine or alcohol. Most migraines occur in different “phases,” with the aura phase occurring prior to the development of a headache (when headaches occur), nausea and other symptoms. Researchers believe auras develop when the nerves in the brain are first hyper-stimulated and then enter a depressed state of low activity called “cortical spreading depression,” which spreads throughout the top layer (cortex) of the brain. As this wave of activity spreads, it travels through different parts of the brain, including the part responsible for vision. It’s this wave of altered neural activity that researchers believe is responsible for the visual symptoms present during the aura phase, as well as symptoms affecting hearing that may also be present during the aura phase. Why Do Some People Have Ocular Migraines With No Headache? The reason why some migraine sufferers may experience visual symptoms without any associated headache either following or before a visual symptom is unknown. What researchers do know is that light plays a role in most migraine events, and that this role can be played out even in patients who are blind. That suggests additional nerve pathways play a role in migraine symptoms, pathways that are not associated with vision. It also underscores the need for further research into migraines to examine the differences that exist between migraine sufferers, including why some patients have a migraine aura without a headache. The good news is, today’s research has begun focusing on migraine pain and aura as two disparate events, leading to more studies focusing on migraine aura without headache (ocular migraine) to improve physicians’ and patients’ understanding of these events. No matter what the underlying cause of these relatively unusual “silent” migraines, the symptoms of ocular migraines still can cause an interruption in daily activities as well as concern and stress for the people who suffer from them. Even though there may be no associated pain, migraine aura without headache still requires optimal treatment to reduce the occurrence of the events as well as to reduce the severity or duration of events that do occur. Historically, getting appropriate and effective treatment for ocular migraines has not been an easy task, due in part to some issues that arise in diagnosing the condition. 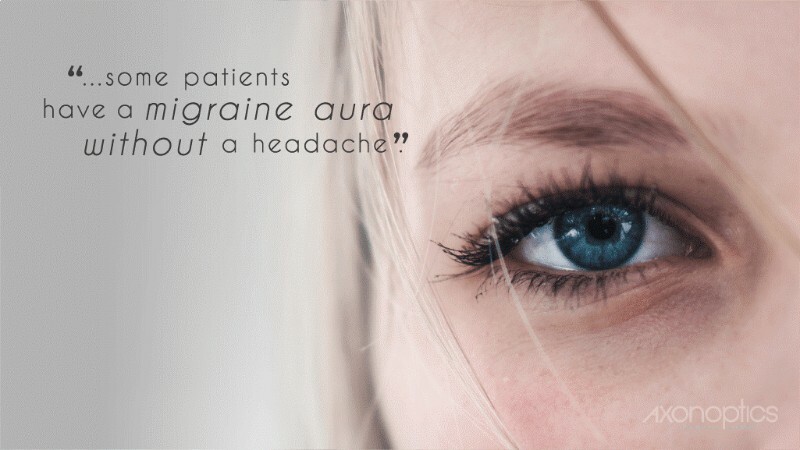 Just as most patients associate migraines with headache, many healthcare practitioners also have a low level of awareness of the symptoms of migraine aura without headache. In the absence of headache symptoms, some healthcare practitioners seek other possible causes, including ocular problems and even chronic stress, resulting in delayed care for many sufferers. At least 2 attacks that meet criteria B through D.
Aura consisting of at least one of the following, with or without speech disturbances but no motor weakness. Fully reversible visual symptoms including positive features (eg. flickering lights, spots, or lines) and/or negative features (ie. loss of vision). Fully reversible sensory symptoms including positive features (ie. pins and needles) and/or negative features (ie. numbness). Homonymous visual symptoms and/or unilateral sensory symptoms. At least one aura develops gradually over > 5 minutes and/or different aura symptoms occur in succession over > 5 minutes. Each symptom lasts > 5 minutes or < 60 minutes. Headache does not occur during aura nor following aura within 60 minutes. Even when a correct diagnosis of ocular migraine is made early on, treatment options are often limited. Do You Have Migraine Aura Without Headache? There are several medications on the market that have been developed to aid in the treatment of migraine symptoms, as well as to potentially prevent migraines from occurring or reduce the severity of migraines when they do occur. Many of these are used to treat ocular migraine as well. However, finding the right combination of medications has proven problematic, and for some people, medications are ineffective, and long-term use may cause side effects including rebound headaches. More recently, studies have focused on the effects of light as a migraine trigger, using special lenses to mitigate the light that enters the eye, filtering out the wavelengths that have been identified with an increase in migraine symptoms and activity. Studies dating back to the mid-1980s have demonstrated that lenses with a type of tinting have proven very effective in reducing the occurrence of migraines and limiting the symptoms and duration of migraines when they occur. Axon Optics is a leading provider of these lenses thanks in part to the rigorous quality control standards it implements. If you have migraine aura with or without headache, Axon Optics’ migraine glasses could be just what the doctor ordered for helping you reduce your symptoms. To learn more about Axon Optics, explore our website, like us on Facebook or ask your eye doctor if Axon Optics’ therapeutic lenses are right for you. Resources: This article is based on academic articles and interviews. “‘Retinal Migraine’ Is an Oxymoron : Journal of Neuro-Ophthalmology.” LWW, Oxford University Press, journals.lww.com/jneuro-ophthalmology/Fulltext/2007/03000/_Retinal_Migraine__is_an_Oxymoron.1.aspx. “Anonymous (Not Verified).” Arizona RETINA Project, azretina.sites.arizona.edu/content/ocular-migraines-0. Carson-DeWitt, Rosalyn, and Colleen Doherty. “What to Know About Retinal and Ocular Migraines.” Verywell Health, Verywellhealth, www.verywellhealth.com/what-you-need-to-know-about-retinal-and-ocular-migraines-3862386. Doyle, E, et al. The British Journal of Ophthalmology, Copyright 2004 British Journal of Ophthalmology, Feb. 2004, www.ncbi.nlm.nih.gov/pmc/articles/PMC1772006/. “Most Cases Labeled as ‘Retinal Migraine’ Are Not Migraine : Journal of Neuro-Ophthalmology.” LWW, Oxford University Press, journals.lww.com/jneuro-ophthalmology/Fulltext/2007/03000/Most_Cases_Labeled_as__Retinal_Migraine__Are_Not.2.aspx. Nichols, Hannah. “Retinal Migraine: Causes, Symptoms, and Treatment.” Medical News Today, MediLexicon International, www.medicalnewstoday.com/articles/314917.php. “Ocular Migraines Explained – All About Vision [Animation].” All About Vision, www.allaboutvision.com/conditions/ocular-migraine.htm. what can alleviate the symptoms of ocular migraine? Can Lutein help? Thank you for sharing this article about ocular migraine. This is a very informative and it’s really nice to know things like this so we can also share it with our families and friends. Thank you for participating and sharing your comments.